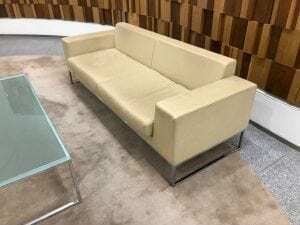 The ultra-modern, contemporary Boss Design Layla Sofa is suitable for reception areas, lounge areas or even offices. It is finished in luxurious cream leather on a refined polished steel looped base. As well as being an appealing sofa, it is ergonomic and supportive with padded upholstery and a moulded seat and foam back, ensuring instant and ongoing comfort for the user. We have 2 Boss Design Layla armchairs to complement this sofa, as well as a classy Boss Design Layla coffee table. This can be viewed in our showroom along with all our other used office furniture. If you see a product you are interested in, you can contact one of our sales team by calling 07944 508282. Alternatively, if you are viewing our website using a Mobile Device, you can click on the Telephone Icon located at the bottom right hand side of your screen. Finished in Luxurious Cream Leather. Moulded Seat and Foam Back Rest. Dimensions: 2000w x 710d x 660h mm. Seat height 385mm – Seat Depth 550mm.